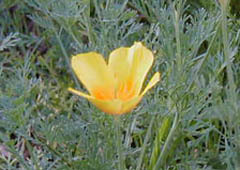 California Poppies quickly lay down mats of fern-like foliage from which emerge brilliant red, orange and yellow flowers to dazzle the summer garden. Particularly good for covering dry sites that get watered infrequently. Thrives in dry, sandy areas, and will stand up well to heat. Flowers close at night, when it is overcast, and when it is raining. Propagate by seed - This plant does not transplant well and should be grown from seeds scattered outdoors in the spring when the soil becomes workable. Scatter the seeds where the plants are desired for summer bloom. This plant may seem like it is a perennial, coming back in the same place every year due to self-seeding. However, self-seeding may not produce plants identical to the initial planted variety. Deadhead to maximize blooming, but leave some spent flowers on the plants for self-seeding purposes. Look for single or double flowers, color variations and variegation. �Mission Bells' Mix: ruffled semi-double flowers in red, pink, orange and yellow shades. Plants are 6� tall and good performers. �Thai Silk� Series: shiny, silky flowers in wide variety of bright colors on 10� tall plants with bronze tinted foliage. �Champagne and Roses�: single flowers with ruffled, fluted petals in magenta-rose and champagne pink. Plants are 8 to 10� tall and very striking in the garden. 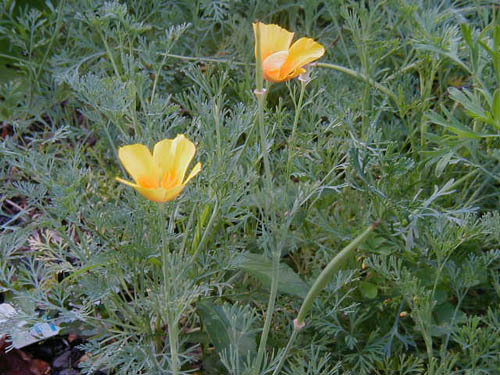 �Buttermilk�: 8 to 10� tall plants with cream colored flowers over blue green foliage. �Carmine King�: crimson ruffled petals fade to creamy white near the yellow flower centers.